A few thoughts on the First Set Reading 5-7 Arsenal League Cup match – Amazing!! | "It's all about the Arsenal"
A few thoughts on the First Set Reading 5-7 Arsenal League Cup match – Amazing!! Tuesday morning, match day… A week off work – school holidays, all packed with two days away at Alton Towers to look forward too. Arrived around 3pm quite nice lodging in a place called Cotton, right out in the sticks which is not to far from Middle Earth, inhabited by Orcs, or what we call in the football trade…. STOKE!!! I ordered food up as the Pig roasting on the fire looked good though handling the remote with greasy fingers is not easy. So food consumed and mead ordered, it was time to sit and watch The Arsenal away to Reading. having put six past Coventry in the last round, I fully expected a mixed team of first team and fringe players to take the tie and Arsenal to progress. The team : Martinez; Jenkinson, Djourou, Miquel, Koscielny; Frimpong, Coquelin; Walcott, Arshavin, Gnabry; Chamakh. Subs: Shea, Yennaris, Squillaci, Bellerin, Eisfeld, Meade, Giroud. The ref blows for the start of the match, about the only thing he did right 🙂 Some might the joke behind this… Arsenal are straight on the back foot and concede a couple of early corners, the second of which was headed onto the post by Morrison and as it came off the post, Martinez cleared with a great header he knew nothing about. Frimpong puts Theo away, Reading clear for a corner. What do Corners make for Arsenal? Oh B*****x Goal!!! Reading Corner is cleared by Miquel but no matter what Arsenal try they cannot get it far enough away and the ball falls to Ledgerwood who hits a left foot screamer from the edge of the area and Martinez flings out an arm as if posing for a photo and can only somehow palm the ball into his own net… 3-0 Reading… 20 mins gone.. I drove the two mins back down the dark Country lane to the lodgings and decided to take the rest of the match in on Twitter as we had Wi-Fi. 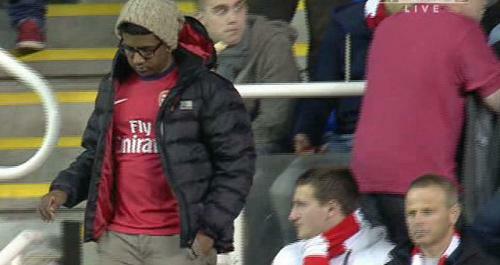 Arsenal fan on his way for an early pint. Fair play to the bloke he did tweet a picture from the stand in the second half to show he was still there supporting. HT 4-1 to Reading… Now is the time for Arsene to earn some of the £7m he earns and so widely talked about. Cups of tea need to thrown. The hairdryer needs to be switched on. If you don’t want to play for Arsenal, there is the door and the M4 back to London is a that-a-way and it’s a long walk… Otherwise buck your idea’s up and get out there and show some pride in the shirt you wear. Shocking first half. I put the saucepan on the logs and boil some water to make a cup of tea. I close Twitter for 15 mins, no need to add any undue pressure as I could have ended up boiling a bit more than the kettle was… They say a nice cup of tea sorts most problems. Well this one was extra nice. So here goes nothing..
Frimpong and Gnabry off, Giroud and Eisfeld on. “We’re by far the greatest team the world has ever seen” Maybe not this team though. Oooooooo!!! Great cross and there is Giroud again to head towards the goal and somehow Federici saves again down low at the near post… The away end is rocking and you get the feeling something could happen… Sadly it’s now been 24 mins since we scored our second and the tweets coming in are saying that this is now maybe a bridge to far for the Gunners and with eighty-eight minutes gone Reading still 4-2 to the good. Hold the phone… What’s this another Gooooooooooooooal!!! OMG!!! Two minutes of Normal time left and my time line has gone bonkers… Arsenal corner, surely not twice in one evening… Arshavin takes and there is Bossielny to head into the net unmarked for 3-4 The away end is going bonkers and there is a belief that sometimes things happen in football and this could yet be one of those nights… The Boss runs into the net, picks the ball up and rushes back to the half way line, no time to lose… Twitter is alive!!! Arsenal throw-in. Miquel takes it to Coquelin who crosses it into the area. Up goes to Giroud gets his head to the cross and the ball falls to Theo who controls with his left peg then quickly shoots also with his left peg across the goal, the ball handballed on the line and then kicked off the line “Over the line” Tweets say, however Jenkinson is there on hand to slam the ball into the net to make sure. The players, fans at the ground and the rest of Gooner world go mad, Arsenal have done it, come back from the dead, 4-0 down to grab an equaliser in the 95th minute. That’ll teach Reading for time-wasting. The referee blows normal time is over… 4-4 and we are still alive in the competition that apparently we couldn’t give a Gareth Bale about. A game of two halves if ever there was one. Just wonder what would have happened if Jenko had not followed up and scored. Handball and over the line and I’m still not convinced the Lino or Ref would have given the goal, had Jenkinson got them out of the stickiest situation, since sticky the stick insect got stuck to a sticky bun. Extra time to be played. Giroud thought it was all over and he threw hsi shirt into the crowd, they don’t get the League Cup in France, he didn’t realise there are no replays and there must be a result on the night. Giroud had to get his shirt back from the crowd. Reading early extra-time chance and good save by Martinez. A bit of a lull in proceedings as both teams cath their breath in an amazing match.. Gooooooooooooool!! We’re in front for the first time… Kosielny-Miquel-Chamakh-Giroud-Arshavin back to Chamakh who lines up a shot, Row “Z” ducks, but blimey the Gods are with Arsenal tonight as Chamakh hits a low rocket past Federici to make it 4-5 to the Arsenal. What a game… What a turnaround for the books.. Chance for Theo as he runs with the ball, tries a pass which is cut out yet manages to win the ball back and with only the goalie to beat, hits it straight at Federici, should have been 4-6… However, Theo is doing well tonight. Martinez wasting time and rightly booked. Also makes a good a save from a free kick. Oh Noooooooooooooooooo!!!! 5-5 Pogrebnyakyakyakyakyak… Unbelievable!!! A cross from the left goes right over everyone and the ball falls for Gunter whose shot is deflected by Arshavin to Pogrebnyakyakyakyakyak who head in from six yards out. It looks like penalties now. What a crazy game. Blow the sodding whistle!!! Blow the sodding whistle!!! Finally FT 5-7 and first set to Arsenal. That’s 6 v Coventry… 7 v Reading… 8 v Bradford anyone? Amazing game of football. Not the best advert for defensive football, but then who cares? To come back from 4-0 in any game is brilliant but to come back from 4-0 down to score 7 (Seven) is amazing… One part of me wishes I had stayed in the pub with the Orcs, but the other was happy to follow this game on twitter as the ups and downs of Gooners was laid bare. Down and out then top of the world, all in 75 mins after half-time. ← A few thoughts on the Arsenal 1-0 QPR league match… He’s Back!!! Brilliant, Steve. you are a very funny man. You have described Tuesday night just as I remember it. As you say we do not experience many nights like that, for those with heart problems, it’s just as well. Hope the wife & children were not traumatised by your enthusiasm.